Milton summers can be hot and muggy, making air conditioning an essential part of daily travel. There can be several different reasons that could explain why your frigid air has suddenly turned balmy. One possibility is that there is some type of refrigerant leak. This leak could be found in the hose, condenser, or evaporator in which case you should bring your vehicle in for Precision Service. A second reason for the air conditioning unit to suddenly prefer blowing warm air may be because the compressor itself has gone bad. The main function of the compressor is to pressurize the contents in the refrigerant, and then pump it throughout the necessary components of the AC. With the entire system revolving around the compressor, the unit will not work correctly if there is something wrong with it. If the compressor is actually broken, generally you will hear a loud noise when you go to turn the air conditioning on in your vehicle. One other problem that may be occurring with your vehicle's air conditioning system, is a potential clogged orifice tube. This tube is located between the evaporator in the passenger compartment, and the condenser in front of the radiator. And instruction in this tube will make it impossible for the refrigerant to reach the evaporator, resulting in the system blowing warm air. Here's how a air conditioning system and all of its components work. Step One: The compressor is called the power unit of the entire A/C system. A drive belt connected to the crankshaft on the engine is what the compressor is powered by. 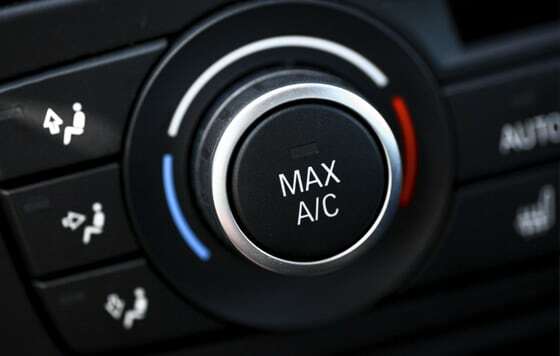 When you turn on the air conditioning system in your vehicle, the compressor uses high heat and high pressure to pump out refrigerant vapor. Step Two: The condenser is a small device that is used to change the consistency of the high-pressure refrigerant vapor into liquid form. It has small cooling fins and parallel tubing, making it look very similar to the radiator it is mounted in front of. If you gaze through the grille of a car, and see what you believe is the radiator, most likely you are seeing the condenser. During movement of the car, air that is flowing through the condenser takes heat out of the refrigerant, changing it to a state of liquid. Step Three: Refrigerant moves next into the receiver-drier. This is where the liquid refrigerant is stored. Moisture from the refrigerant is also removed here. This is essential since any moisture that is lingering around can freeze in the system, effectively causing a block in the tube. Step Four: While the compressor works continuously to efficiently pressurize the system, the new liquid refrigerant, which is under high pressure circulates from the receiver-drier to the important thermostatic expansion valve. The purpose of this valve is to remove pressure in the liquid refrigerant so that it is able to expand and once again become refrigerant vapor in the back in evaporator. Step Five: The evaporator is very much like the condenser. It contains fins and tubes, and it is most often mounted inside the vehicle passenger compartment. The cold low-pressure refrigerant gets released into the evaporator, where it vaporizes and then absorbs the heat from the air inside the passenger compartment. Once the heat is absorbed, then new cool air will be available for the occupants of your vehicle. In order to distribute the cooler air effectively, there is a blower fan located inside the passenger compartment. Step Six: Full of heat, the low-pressure refrigerant vapor is drawn back into the compressor in order to begin another cycle of refrigeration. Clogged areas such as liquid refrigerant line, receiver-drier, or expansion valve. Filter or expansion valve that is partially clogged. In general, it is best to leave the majority of A/C repairs to Gorruds Auto in Milton, Ontario, Canada. Very often there is special equipment that must be used and that the average person does not own. The system should be checked as part of the maintenance program on you vehicle at regular intervals. The Precision Service team members at Gorruds Auto will be happy to fix any problems in the system, and also look for areas of wear that may become a problem down the road.